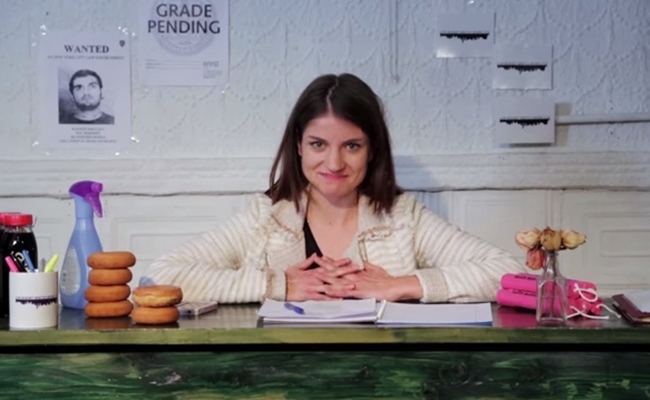 A new variety web series is putting its shoestring foundation out in the open. It’s called the Low Budget Sketch Show, and despite its title, it offers a smooth blend of sketches, monologues, and fake ads. As with many other series in our Indie Spotlight, the team behind Low Budget Sketch Show was assembled from well-known improv hotbeds such as Upright Citizens Brigade and The Pit. Each episode is split into three parts: First, host Bridey Elliott delivers a monologue that introduces the rough theme of the episode. Each intro is then followed by a sketch comedy scene and a fake commercial that would make Rhett and Link proud. Thus far, three episodes have been released, and Low Budget Sketch Show‘s ability to get a lot of mileage out of its apparently small funding is impressive. The sketches often tread on well-tread New York comedy tropes such as gentrifying neighborhoods and crazy subway posters, but there’s plenty to like even if you can’t stand the Big Apple. Low Budget Sketch Show doesn’t have any pretensions about its quality, and that’s why it works. It’s simple, fun, and a solid use of four minutes. Young Couple. Two Chicago comedians explore the daily minutiae of life as a married couple. Ghost Shrink. This series is the latest additionei to one of the web series world’s trendiest genres: paranormal comedy. Chris & Sami Present How To Live Together. The titular protagonists are a couple who offer a funny and sneakily well-shot look at cohabitation. Dear Future Wife. A lonely, awkward guy searches for the woman with whom he will spend the rest of his life.